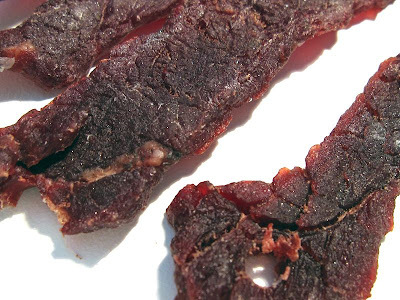 Branding Iron Beef Jerky is a brand of JW Distributing, Inc., based out of Santa Maria, CA. JW Distributing distributes products to convenience stores and liquor stores all across the central coast of California. They actually specialize in meat snacks, distributing a wide variety of brands. They also produce their own energy drink called "Energy Shooter". Branding Iron Beef Jerky is their own house brand, and according to Jim, the company founder, it's generated a lot of revenue for them. It's a private labeled product, manufactured by Werner Gourmet Meat Snacks, of Tillamook, OR, the maker of Werner Beef Jerky. However, Jim says you can't buy this online, it's only in those small stores along the central California coast. But he did offer to pay me a cut of sales if I wanted to be his first online retailer. I turned him down, but you might you want to contact him at his Energy Shooter website if you're interested. 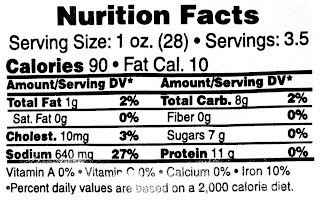 FYI: notice the misspelling of "Nurition Facts" on the label below? Beef, brown sugar, water, salt, worcestershire sauce, monosodium glutamate, spices, garlic powder, citric acid, sodium nitrite. The first thing I taste from the surface of these pieces is a light sweet and salty flavor, and then maybe a hint of smokiness. In the chewing flavor, I taste more sweetness right away, then some more saltiness, and that's about it. For being billed as a "sweet & spicy" variety, it seems to fall short of my expectations. While there is indeed a noticeable sweetness, there's not much spiciness to this. The sweet intensity is at a low-to-moderate level, with some pieces being low, and others moderate. The spiciness seems absent-to-low, perhaps more on the absent-side. Over the course of several pieces, I do detect a weak burn in the back of my mouth. Suffice to say, it's ranks mild on my hot scale. The salt intensity ranks about moderate, and is easily tolerated. The worcestershire sauce listed in the ingredients seems to make only a weak showing. I can taste its influence on this jerky, but I don't get a defined worcestershire flavor. 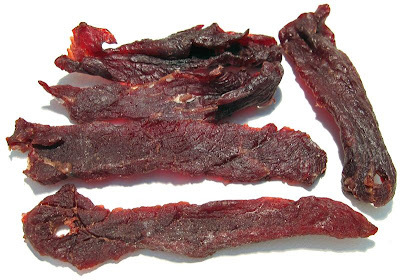 Overall, the primary flavor you're going to get from this jerky is the sweetness, starting with the surface flavor, and going about half-way through the chewing flavor. The saltiness is also noticeable on the surface, but it's not until about the latter-half of chewing that it finally overtakes the sweetness. There's just a tad of worcestershire in the chewing flavor to make this interesting, but not really anything spicy. These appear to be slices of whole meat, sliced into strips of a medium thickness, and in small to medium sized pieces. It's largely a dry jerky, but with a lot of flexibility. Tearing pieces apart is mostly easy, maybe a bit of effort here and there. Because these are in strips, you don't need to tear them, just bite them off. Chewing seems moderately easy. The chewing texture starts out feeling stiff, but seems to break apart easily enough that it chews down quickly, maybe in about 15 seconds. I don't get much rubbery-resistance. Once its chewed down, there's some steak-like texture, but more soft. It perhaps resembles a medium-cooked steak. I see small bits of fat on a few pieces, but did not encounter any tendon, gristle, or any chewy sinews. It's also clean eating, leaving no residue on my fingers, and no fragments of meat on my lap or desk. For general jerky snacking purposes, at this price per ounce, it seems to offer a fair value. I get an average amount of snackability due to its satisfying flavor, and easy eating. It satisfies my meat snacking urges at a decent level, but it doesn't go beyond that. The $1.71 price per ounce is perhaps just on the outer-edge of what I'd pay for something like this. But as a "sweet & spicy" beef jerky, also at the $1.71 price per ounce, it's a weak value. All I'm really getting is the sweet, and none of the spicy, or maybe just a tad spicy at best. If you're in the market for sweet & spicy jerky, which I frequent am, I don't think this price is going to compensate you equally. This Sweet & Spicy variety from Branding Iron Beef Jerky provides an average amount of snackability through a satisfying flavor and easy eating. I say "satisfying" flavor because I think it has a flavor that 80% of meat snackers will find enjoyable, but it won't grab your attention, it won't open your eyes. I don't think this jerky lives up to its billing as "sweet & spicy". It's got the sweet, but doesn't really have the spicy. Perhaps if you have highly sensitive taste buds, you'd see it differently, but then again, if that's what you have I doubt you'd buy anything labeled "spicy" anyways. Overall, it's still a good snacking jerky to keep your jaws occupied while you're working, driving, or watching television. For a good beer pairing, I'd recommend a plain pale ale. I LOVE the Honey Glazed brand! My favorite!